My friend was having a tough time activating his new Reliance Jio 4G sim, the activation was completed from the company's end but there was no signal/tower on my friends compatible 4G phone. Nobody had a clue what was wrong? As usual we made sure common issues like the ones listed below were taken care of but nothing helped. Your phone does not support 4G, and if does make sure it supports spectrum bands compatible with Jio (800 MHz,1800 MHz and 2300 MHz). Your phone has Dual-SIM support but only one sim supports 4G, if this is the case make sure you insert the sim in correct 4G compatible slot which is usually the first slot. Ensure that the phone is set to work with LTE network mode (Settings > Mobile Networks > Preferred network type.) and data option is switched on for the 4G compatible primary slot. If above two conditions are met and you still do not get signal, make sure your sim is properly inserted and is activated from the operator's end. Try re-inserting the SIM and restart your phone. Unfortunately, no solution from the above list worked for my friend and by fluke he toggled the "Accessibility->Switch Access" option on his Yu Yuphoria phone and the network came. 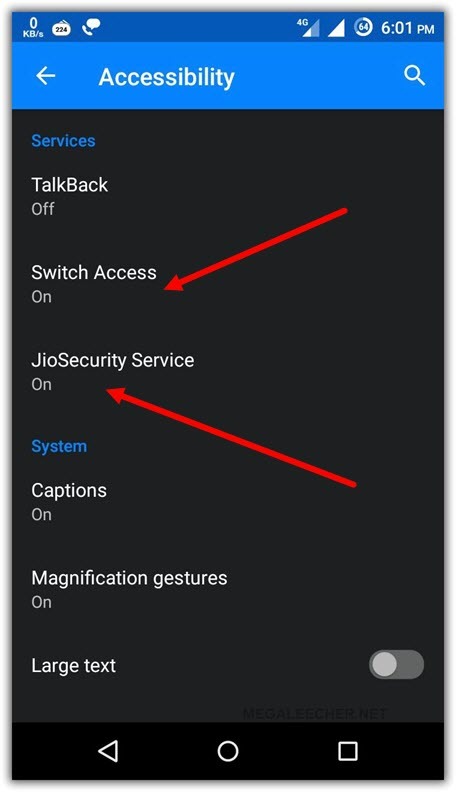 While I am pretty much convinced this should not be the reason for the network to appear, but having a Reliance Jio Security setting in there as shown below makes things a bit confusing??? If you are having a similar issue, try this unconvincing solution and if this works do share your results with us in comments section below. sir, i've yu yuphoria and having same problem of not getting signal in sim. my sim is started,verified evrything is done but unable to see any signal bars in sim. kindly suggest me some tips to fix this issue. please. Do you try cm13latest build..
hey...pls help me...i have the same problem as yours....my sim is not yet activated....but it was recieving full signal....but after i restarted my phone signal is gone...i turned on the switch access in accessibility but there is no jio security....what should i do? click the 3 dots present and reset it to default..
Pl.install jio security app from google play store and keep it on ...we think your problem will be solved. hi, I am using yu yureka. I tried all u mentioned, but did not solve the problem. funny thing is I am only getting network while roaming and not when in home state. Have you tested the "Accessibility->Switch Access" solution shared above, this should fix the Jio Sim issue. yes sir i've tested this tip. Sir... I have new jio sim since 10 days... But in my mi4i phone not showing any network... Even i have tried your tricks.. But it doesnt work with my mi4i phone.... What should i do? Thanks a lot, this is the only thing which brought the network bars, thanks again! My Jio network is not available(0 strength). It worked for my red mi 4 . And then select click on turn on the radio option and then choose LTE only mode then turn off the radio option and then restart ur phone. then in settings ->mobile networks ->jio 46 ->Access point Names. create a new apn with name = jio 4g and APN -> www. Hope this would work. as i faces the same problem with my eureka. But not activate till now. And then select click on turn on the radio option and then choose LTE only mode then turn off the radio option and then restart ur phone if this option doesn't work try other options following the same steps. And check whether you are getting Jio 4g option when you select network manually.. good luck !! I tried this one but its not letting me choose LTE only. I am clicking on it but still its not selecting it. sir, i've lenovo vibe k5 and having same problem of not getting signal in sim. my sim is started,verified evrything is done but unable to see any signal bars in sim. kindly suggest me some tips to fix this issue. please. Kindly change in settings-sim management-default 4g/3g subscribtion- select Jio and tower will come. My plan was activated 3 days ago. I was able to use the unlimited data services for only a day. I have activated the unlimited data also after 2GB usage. 2 days ago, the network connection went down and there is no range bars showing also. Please help me with this issue fast. If you cant see the jio signal dont worry. Download jio security on google play. It will ask you to do certain process you can do that, After that in jio security app, you can see some category like risk,medium risk,no risk...make all apps from risk and medium risk category as trusted..finally turn on your location and proceed for setup in jio security app. I can make calls from jio sim but cannot use the internet. there an exclamation mark on my range bar. but wen I inserted my friends jio sim it worked fine even I was able to access 4G. Me and my friends faced the same problem and found a working solution, which is not suggested in this post. This should activate your sim and get access to the signal..
WOW! Tats very very Wise Answer that no one knew in the universe!!!! thanks a lot ji! I suggest every one who commentE's here to create a new APN by the name of Jionet. I can not see network jio signal.appear no network/emergency call only on my redmi 2 prime handset. Pls help me anybody. Its working for me !!!! Which phone do u use? Do u have any jio apps? Plz tell me every setting u did .....coz I use you yuphoria marshmallow and I don't have switch access !!!! I have intec aqua ace mini ,I have problem of my jio sim does not shows network.what should I do. what can i do this ? I bought jio mifi at 4th sep 2016 and verification done at 8th sep 2016 still no signal in my jio mifi is there any sollution regarding this issue? What can i do further? When I call 1977 for my voice call tele verification to get 4g voice service but the calls end automatically. My Data service is working.but voice call is not yet televerified.even I couldn't connect with 1977 for getting voice service.what to do? Hi.. I have jio sim and ready for tele verification. My phone is rooted and currently using marshmallow (viperOneM8 6.0.0)in my phone .. The problem is I am unable to get any signal in my phone using jio sim. I did everything u have mentioned above but still it's not working.. Pls guide.. Thanx in advance..
activation message is already got,but network is not there.so How can i fix that? Bro I have activated my Jio sim perfectly within 3 days of purchase on device samsung galaxy j2 (2016).I also got the access to Jio welcome offer which offered me 4GB net per day post speed 128 kbps,but after 10 mins my net stopped working. It is on and when I open anything it take me to Jio page saying u have exhausted your credit limit.When I recharge it says u r currently on a plan that renews itself every month.Please bro help me. My contact no is +91 9838944491. My sim is ready for tele verification but I'm travelling in other state. I tried lot many time to call on 1977 but call is not going through, is it, due to roaming I cannot call to customer care? can anyone tell me moto e 2nd gen 3g support relience jio 4g sim? Hi, I tried your trick, but it didn't work for me.. But, then I found a solution in one video - The *#*#4636#*#* trick worked for me. I am using Yureka cm12.1 stable release. my jio sim was activated and for a month it worked fine. afterwards suddenly jio sim use to show no signal even though other jio sim in my frnds mobile showed signal. i formatted my yu device still issue was there so i tried trick *#*#4636#*#* clicked on turn off radio then clicked on turn on lte ramp dump them clicked on turn on radio after that i retarted device. this is best possible solution what i got for yu devices apart from switch access. but problem still arises after few days or sometimes few hours. so repeat the same. Please anyone help me as My Jio no. is activated, but as soon as I receive the signal in my Sim 1 (Jio), the sim 2 signal vanishes. Any solution????? Network signals are not Coming at Office & poor Signals are coming in open area. This trick works perfectly.. ! activated sim but signal not coming. My jio sim is activated but signal is not coming or I can't receive any comformation massage/call from my given mobile no. my number is 9402587147 so please help me this problems. Hey I am using Moto g3 internet , and messaging is working . But I am not able to make calls what should I do plz help. I am getting full network on my nexus 5x 4g phone but when i switch on cellular data it's asking me to sign in to network and recharge if its prepaid and pay bill if its postpaid and mines prepaid so when i type my number there it tells me that i am using jio welcome offer no need to recharge but my net doesn't work exept for an exclamatory mark beside LTE symbol. Kindly help me. BRO,YESTERDAY I GOT A JIO BY EKYC PROCESS.AFTER 2 HOURS SIM IS ACTIVATED AND INTERNET IS WORKING.BUT TODAY MORNING WHEN I SAW MOBILE,JIO SIM SIGNAL IS GONE.SO PLZ SUGGEST ME WHAT I DO? I got signal befor 2 days..and git msgs many time that yiur sim is ready for tele verification.. but when i try to call on 1977 it got disconnected every time..
Can some one help me with the Jio sim. The movement I switch to Jio Sim, the signal tower comes with an exclamatory symbol and I'm not able to browse. I was using Jio sim in my HTC for 2 months , but today suddenly the signal got disconnected. i tried enabling accessibility options , tried to enter test mode and turned radio off and then on, restarted the phone many times , but the sim is not able to register manually or automatically to Jio 4G network, can some one help me. I was using all jio services perfectly on yu yuphoria for a week and then suddenly the network gone. I tries all the above mentioned tricks ie.*#*#4346.. , changes in accessibility , download jio security app. But none of these worked for me. What worked for me: I simply removed my other sim card, put jio in SIM 2 (only jio sim and no other sim card ) >> switch on mobile >> network type for SIM 2 LTE/4g and your phone will show network. Now switched off phone and put jio sim back in sim 1 and change SIM 1 to 4g. Somehow this trick worked for me. After this you can put your other sim card in sim two. Please note that my jio sim was activated and I was using it for a week. Try this out.. May be this work out for you too. The same trick to replace sim 1 to sim2 also worked for me. Thanks brother for sharing your valuable tip. Im using HtC desire 820 (single sim) . Jio sim was activated 2 months ago and there was no problem till few hours ago. Im not getting any signals and i tried all the tricks mentioned here. Can anyone help me out !!!please. ANY ONE HAS THE SOLUTION FOR REDMI NOTE 4G, SIGNAL IS APPEARING FULL BUT NOTHING IS GETTING WORKED NOT INTERNET NO CALLING 3 DAYS BEFORE BUY IT. My Jio sim was working very well in mimax but the moment I got another jio sim on the same mobile number..it stopped workin..now I cannot make calls even neither from jio sim or bsnl sim..pliz help me out..it is very urgent..
My sim show the network but the data connection not started yet and I don't call 1977 for verification. I purchase jio 4 days before.. I'm using Redmi Note 3, and activated Jio Sim two days ago and used Internet and called to my friends, but from today morning its not showing any signal. I tried to put it in other sim slot of my phone, as both are 4G supported. I tried calling CC, they said we'll check. Plz let me know what to do to get Network. Thanks. I took my jio sim yesterday.Today in the morning it showed network so i thought to activate my jio sim.i called on 18008899999 and 18008901977 through my current no. because when i called on 1977 from my jio sim, every time the call ended.when i called from my current no.It said that my jio no. is activated so why can't i use internet or calling services. One thing more, i didn't recieve any email or sms from the company. Guys - I have HTC One M7 Verizon 4G LTE, i have tried installing Android, 4,5,5.1 & 6 but Jio SIM showing no Service / Emergency calls. But the same sim works fine with other mobiles. Anyone succeeded on HTC One M7? In HTC m7 jio is not working . My jio sim is not getting tower after 5 days of installing jio sim please tell me whats the problem?? sir,having some problem of not getting signal in sim. my sim is started,verified evrything is done and 10days used also but but now am not getting signals kindly suggest me some tips to fix this issue. please. Hey.. Pls help me.. No sim card is detected by my phone of jio sim and on calling on customer care i get that my no. Is already tele verified. Please tell me what to do. I'm not able to send sms .plz solve this issue. But if i call to same no , with another sim the calls goes what's the problem ? I am using Samsun Galaxy Grand, I have upgrded my mobile from 3 g to 4g by downloading online app but when i am trying to call it says not registered on network also I am not able to access internet. Although i am able to view jio network. kindly help. Jio sim not working while using dual sim(Reliance), network is full and also working JIO sim if I use JIO sim in my phone. My phone is Lenevo ZUK Z1. Please suggest. I brought Jio sim on sunday and i get to see Jio signal, but when trying to call or activate SIM, i am getting message that "Mobile Network is not available"
kindly some one help me in soughting this issue. I bought my Jio sim day before yesterday.. Till today evening it was working properly and just after I switched on my phone the signal was lost. What should I do? Leave the rest as default or untouched... Boom! You'll probably get back online.. I am using lenovo k3 note. My jio sim is activated but not working in in my phone. I tried to use the sim in another phone and the sim worked. Then why i am getting this problem? How to fix this problem? I am trying to use Jio sim card on Moto G4 Play phone. This sim supports VOLTE for calling. I have put Jio 4G sim in slot 1. Things are working fine and I am getting LTE and VOLTE signals.But at randomly, my LTE sim signal is getting lost and sim 1 is showing as no simcard or emergency calls only. All I need to do is to go to sim settings and disable sim 1 and again enabling it will bring signals back. This is happening randomly during a day and happening every 3 hours 7- 9 times in a day. I even dont know that signal is lost unless I take my phone of pocket for some other work. I have even tried to put second Jio 4G sim to check but same is happening with second sim also. As of now have to keep refreshing the phone every few hours as it stops working. I am missing calls and getting missed call messages. My sim number got activated and i used the data for 1 day. After that there is no network on my phone for jio. I'm also not able to register on my jio app and not getting the otp. I use coolpad note 3. I bought jio sim the day before yesterday. in my phone network has shown fully but yet i cannot connect internet or call.. also I am unble to connect call with 1977 for verification registration.. now what should i do?? please revert as soon as possible..
i updated my galaxy s3 GT-I9300 and my phone was LTE but jio sim not working. I have samsung galaxy s6 edge (australian). Its about 2 days but my sim is not activated. Help me guys. I am not getting continuous signal in my Lenovo phone with jio sim pls any body can help me out? I tried all said above but in vain. It some time appears and goes off long time. i have purchased jio postpaid sim from jammu. It was working very nicely in jammu but now i moved to punjab and this postpaid sim stopped working. Please help if i missed some settings. I am using Jio sim in lenovo k3/note. Data and outgoing call both are working but incoming call is not working. It says that this number doesn't exist. Second issue is whenever I put my another sim in slot 2 Jio sim doesn't work. i used data and call for one day but after that i wasn't working.i tried all the tricks given in youtube. I am using Lenovo K3 Note, preffered network in sim management, showing blank. How to set preffered network to 4G LTE type. My jio sim is not working since from last 3 days, no network coverage it is showing. Sir, Hi i am using Hotwave Cosmo V8 Lte handset. When try to insert jio sim it dont access network provider. When put on manually search it does not show 4g network. But other providers are working good. please suggest me solution for the issue. i bought a jio sim when i was in delhi ncr.i was getting good network there.but after coming to dehradun,premnagar it is showing a cross. i tried the jio security service option as well as network operators method.it is not showing jio sim after searching in network operators even after resetting to default in access point names option.please help me as the sim was working really good in delhi NCR. sir, I got my Jio activated and I used it well. But now am not getting the signal. Please help me. what i have to do for getting nework...???? tis strange but I really got back my Jio Network which has gone missing yesterday by following that switch access method. But it was a different for me, I turn switch access at ON, nothing happened then I turn it off again, then restart the phone, da daaa.. Network is back !! my mobile is moto e3power. my second sim's (vodafone) incoming call is not recieved when jio sim (first slot -volte) net is activated. I inserted it ... but no signal /network... how to solve? I have put JIO sim in slot 1 of coolpad note 3 lite the sim is activated and data service is on but no incoming and out going calls.suggest solution pl. My phone is YU yunique model YU4711. MY JIO SIM DONT SHOW SIGNAL NOW. I USED IT ONE DAY BUT NOW IT DONT SHOW SIGNAL AND I CANT ANY THING. PLZ HELP ME. My jio sim is not receiving network. Sir I have Xiomi Note 3 but my phone is not receiving network what should I do for that. which is compatible for jio network, still network bars are not visible. Sir I have Samsung Galaxy J max tab. I bought new jio sim from Delhi but I have I'd of UP. It have passed 11 day but there is no signal in my jio sim. From where I bought it he said it's activated. Please solve my problem what I have to do. It is continuously saying nit registered on network even after 4 days. It's mobile data worked on second day but now its not working and no calls are being activated. Though its showing signal but saying emergency calls only. my device was working efficiently two days back but suddenly the netwrok light got red and start blinking. I tswitched it off several times and after getting on only wifi and battery signal still but network signal blinking. please tell me how to solve this problem. I have this SIM for around more than a month.It was working well until now but since few days I am having an issue of no network. My SIM was activated and was using it since 2 Weeks, when i changed my SIM to other phone(Iphone5) it says NO Service. I tried putting it back in the older phone where it used to work properly(Iphone 6 plus); but still No Service. Kindly help me with the Issue. I am from Hyderabad. Tried ur above mentioned tips in my handset of Moto G4. But network of Jio sim is not dectable. I have very strange issue. The same sim card is working in another hand set of Moto G4. But my Jio sim .. which I took in Hyderabad is not working. I request you to give solution for this issue. I hv redmi 2 prime mobile, I was using JIO with my mobile, but now no network is displayed after I removed sim once from SLot1. It's working with another mobile. I tried all process like *#*#4636#*#* and also tried with another JIO sim. But not getting the network. I also restore to default. But still not getting networks for JIO. sir, i've MOTO-G 1st gen and having same problem of not getting signal in sim. my sim is started,verified evrything is done but unable to see any signal bars in sim. kindly suggest me some tips to fix this issue. please. I tried al d tricks like *#..., jio security, slot1 etc etc.. bt stl i've signals only but call or net not possible.. Thanks for your post but It is continuously saying not registered on network even after 4 days. It's mobile data worked on second day but now its not working and no calls are being activated. Though its showing signal but saying emergency calls only. My Jio sim working fine but from last 4-5 days my second sim(airtel) doesn't work on any slot of my phone showing emergency call..plz help me my phone is yuphoria. I have been using Jio since 2months suddenly it's showing 'emergency calls only' . Tried all the basic settings but couldn' get it ! Anyone atleast here could please help me out! Sir, My jio sim was working well in hyderabad abd bangalore, but when came to Patna, Bihar, no signal bar was showing. I tried many ways like APN setings, *#*#4636#*#*, replacing sim, tried with single sim. Nothing worked out. Kindly suggest solution. Is jio work in htc one m7 ? my mobile setting was deleted when i restart my phone and i create new apn settings with jionet(apn name). HI, i am having htc one x plus phone imported from bulgaria which supported normal networks but this jio is not working for me , can you please help ? There is no JIO network in chennai Siruseri IT park(CTS). Please resolve the issue as soon as possible. From today morning suddenly RJio network is not getting detected. I tried all above options.It came for a brief time and again disappeared. 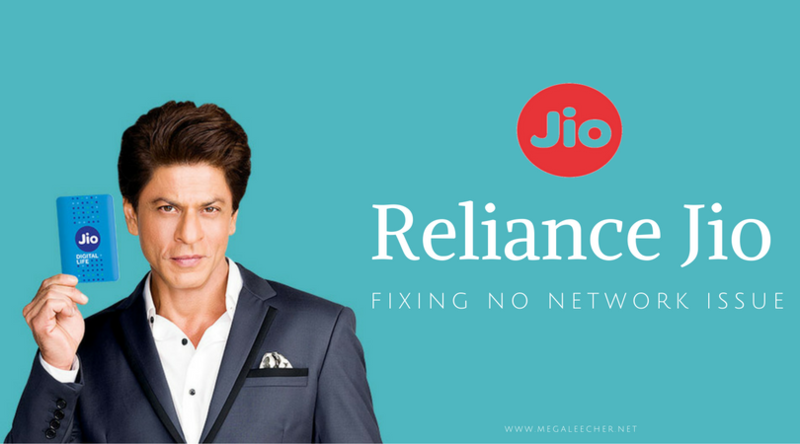 Any suggestions/help to restore the R Jio network? I have restarted the phone many times too.. Someone help me out of this please.. Simple and effective steps - Thanks to whoever posted the ans! After March 31, my Jio internet failed to connect working, I raised a service request with jio and they promptly responded. Yesterday however the signal was not there in the afternoon (May be Jio they were rebooting the number from their end based on my service request). But after 24 hours the internet is back and is working fine after I read the above and edited my dual SIM card settings. Thank you for the clear steps. My Jio sim working in other 4g mobiles and other 4g sims working in my mobile,but JIO sim is not detecting in my mobile ,mobile says no sim detected if i insert only JIO sim. I ve been using the Jio sim and its uninterrupted services since march 2017 and was quite happy with that. Last week i travelled abroad and on my return I see no volte signal and i cant make calls and open internet. Have already tried all the solutions mentions above but nothing worked. Jio Sim disconnected while roaming in Karnataka and refused to connect after returning to home n/w in TN. Your solution Worked !! Thanks ! Jio network does not show on uses my villages tower if i going to town then slow network in the phone any solutions ? am using hotwav cosmos v8 , after insert jio sim its showing emergency call only . I am facing problem that if my friend use to call me after 10 pm from another network they get my phone busy.but they call me from jio than connecting is OK. Why it show busy from another network?? Around 10 days back, i lost my Jio network while texting. I tried to reboot the phone amd re-inserting the sim but i didn't receive the network. It's been more than a week and i still have'nt got the network back. I have Jio sim no.